It goes without saying that 2016 was a grevous year for the music industry. Losing artistic vanguards like Bowie, Prince, and Killmeister was jarring to fans of all genres. From this tragedy came one of the most hauting pieces of work from David Bowie this year. BlackStar was really good when it came out at the waning hours of 2015 but when you re-listen to it with the knowlege of his impending passing it turns into a whole new experience. The Avalanches, after a 15 year hiatus, came out with new material and it's brilliant. The entire album is a journey through a flea market vinyl box at Tim Burton's house. It's flawless integration of obscure genres and etheral themes. It's probably my favorite album release this year. This list mutated alot this year and over 50 songs didn't make the cut. Using Spotify exclusively this year really helped me to keep atune to all the new releases and find some absolute gems. As always, it's very electronically biased since that's my personal preference. Surprisingly, hip-hop did not offer me much this year. clipping and Run the Jewels are too damn good making everyone else in the genre really hard to get my attention. As bad as 2016 was more most people personally, I think the music industry really gave us alot to enjoy. 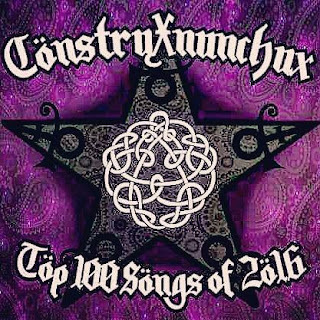 Hopefully 2017 will bring us that Tool album we've been waiting for since 2001. 4. Moby - Are You Lost In The World Like Me? 3. Har Mar Superstar - How Did I Get Through The Day? 78 Square Hammer - Ghost B.C. 98 Why Tho - um..